Christmas celebrations and the nativity scene goes hand in hand. The Willow Tree 6 piece nativity set gift idea is a meaningful choice indeed. Everyone loves the touching Christmas story. Complete your Christmas decorations with the nativity scene and have a meaningful and joyful holiday season with family and friends. The classic nativity scene is a traditional Christmas decor for most families. 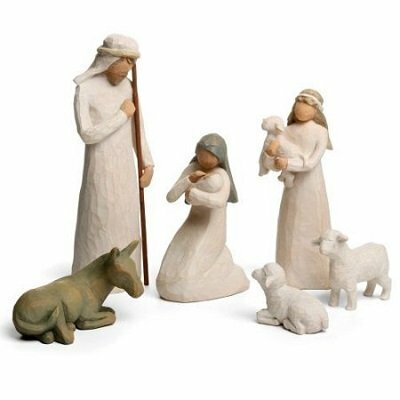 Originally introduced in 2000, this 6 piece nativity scene by Willow Tree creates such a peaceful and calming presence. It is such a joy looking at the different figurines that make up the nativity scene; Joseph, virgin Mary lovingly cradling baby Jesus, the donkey, shepherd and the 2 sheep. Made from resin and wood composite, Joseph, the tallest figurine stands at a height of 9.5″. The Willow Tree figurines do not have facial features. It is up to you to imagine how beautiful they look. 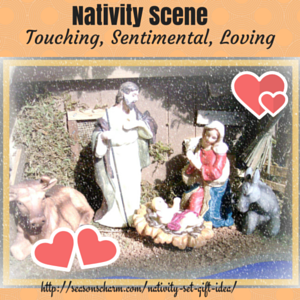 Imagine the love in Mary’s eyes as she gently caresses baby Jesus. You can also buy the creche and metal star backdrop separately to complete the nativity scene. Beautifully crafted, the Willow Tree 6 piece nativity set is a great sentimental gift idea whether for Christmas, birthdays, weddings or as housewarming gifts.